As part of my thesis research, I am working on a project that examines how geo-located social media (geosocial media) can be used as a tool for citizens and local governments to communicate infrastructure-related issues and what data quality challenges many citizens and local governments face when using geosocial media. I surveyed citizens about how they evaluate the quality of geosocial media information using a case study of reporting sidewalk issues. A study web site was developed to provide participants with background knowledge of geosocial media and their potential applications. 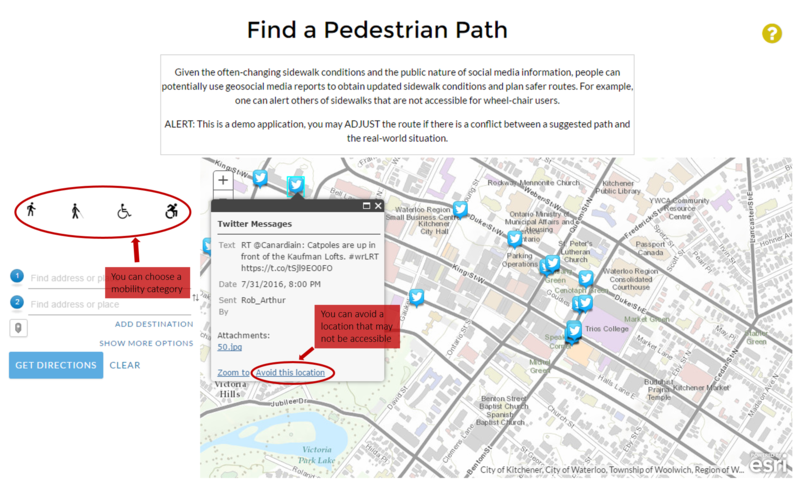 The web site includes a web map interface that displays geosocial media posts related to sidewalk issues. All the geosocial media posts were retrieved using Twitter and Flickr public APIs. Users can click on the icon to read the content of a social media post. I also demonstrated a potential application of using geosocial media to help pedestrians plan safe routes. Given that social media is an open communication platform, people are in fact sharing their observations of sidewalks with the public when reporting an issue to local government. These collective observations of sidewalk conditions may help people identify and avoid transient barriers such as construction and unexpected hazards. In the demonstrated application, users can view social media posts on the map, and choose to avoid locations that are likely to be not accessible. Users can also customize their pedestrian paths by selecting their mobility category. For example, cane users may need to avoid excessive slope on their paths.